Join us tomorrow for Seattle’s first Critical Lass ride! After seeing how much fun folks are having in Edmonton and Chicago, we knew we had to join the fun and do the same in Seattle! We’re meeting Sunday, May 13 (tomorrow!) at 2 pm at the Ballard Library. What does “an easy, social ride” mean? It means a slow pace, lots of chatting and no one gets left behind. Street clothes, easy routes, and refreshments! This is also part of CycloFemme, a world wide celebration of women & cycling. There will be rides all over the world, which we think is awesome. Let’s ride! UPDATE: The Critical Lass rides in Seattle are now happening monthly! Please visit the Seattle Critical Lass blog and facebook page for updates, summaries of past rides, and photos of participants! When & Where: Our next Critical Lass ride will be the afternoon of Saturday October 15th. We’ll meet at 1:45pm, depart 2pm, and end 3:30pm; and we’ll start & end at Bike Bottleneck (at the racks at the corner of 109 Street and 88 Ave, beside the High Level Diner). Afterward those of us who can stay to hang out will grab a table at one of the many cafes and restaurants in the area. Please leave a comment to vote on these ideas or suggest another route. For those of you on Facebook, here’s the event listing – we’re also discussing the route ideas on the wall. Route: this time we’ll head a block or so north from the LRT station, then counterclockwise around the Saddleback Road -19 Ave – 105 Street – 29 Ave loop (on the new on-street bike lanes). We’ll stop at the Royal Pizza to pick up some food, and carry it with us to the playground at (location TBA, there are several decent-sized ones to choose from, and we want to check closer to our date to make sure the construction is complete on the section where we’ll stop) Steinhauer Elementary School (see below), where the kids can play while we picnic! (So, yeah, you may wish to pack some food and drinks too.). Afterward we’ll finish the loop and head back to the station, where you can either choose the LRT or the bike path to head home. Aug 16th update: I’ve just checked the progress of the lane-painting on this *brand spanking new* bike route, which should be complete by month’s end. This is going to be a great connector for a bunch of bike infrastructure in the southern suburbs, so it’s really exciting to have this chance to check it out! The western half is still mostly awaiting paint, but has signs up (including “call 311 for more information” signs), and the eastern half is all painted – including paint from the 3-way stop on 29 Ave up 106th Street to eventually connect with the rest of the network! So, we’re going to use the playground at Ermineskin Community League / Steinhauer Elementary School on 106th as our stop for eating (it’s a bit bigger and shadier than the one at Keheewin School, and it has picnic tables). You’ll notice that I’ve replaced the original map above with an edited screencap from the Google version of the City of Edmonton Bike Map, so now you can see how our route ties in with the existing network (green lines). The solid yellow is the part where the paint was complete tonight; the dotted yellow is where (I think) is left to be painted; and I’ve marked in our landmarks for the ride in red. *As for the family friendliness of this route: it is on the long side for little ones (at about 8km), and it is an on-street path, so if your kids (like mine) don’t yet ride fairly straight or stop reliably, then they may be safest in a trailer or cargo bike, or on a bike seat or trail-a-bike. 27 Aug update: the forecast is 24 degrees Celsius and sunny, so hats and sunscreen weather! Also, as I’ve noted on the Facebook event page and in comments, it turns out the Saddleback Road location of Royal Pizza doesn’t open until 4:30 – there are other places to grab something before we set off, and a couple of 7-11s en route, but our best bet will be to treat this as a potluck picnic. See you tomorrow! 28 Aug update: since almost nobody was able to come, we are postponing this ride. Stay tuned for details. 9 Sept update: NEW DATE AND TIME for those of you not following the FB event page where this discussion has been ongoing! We’ll go on Sunday, Sept 11th, and since we’re in the middle of a heat wave, meet 9:30am, head out 9:45am, ride the loop counterclockwise, then head to the Century Park location of Brewsters for brunch afterward. Our new friend, who has asked that we not use her name. She’s the coolest, and so her is fab mid-70s Twenty. We all coveted Marilyn’s fantastic skirt from H&M. to the end of Alberta Avenue closest to Coliseum LRT Station, which is the most recent section to have infrastructure upgrades. The site of the old Cromdale Hotel (above) gives a good idea what much of the street looked like a decade ago, when it was best known for its drug-fuelled crime rate. We walked a couple of blocks on the brand-new sidewalks, crowded with people walking in the opposite direction toward Capital Ex, and watched pickup trucks and SUVs whizz past, then decided our best course was to ride on quiet, residential 119th Ave, using the church and community league park as our landmarks to come out onto the sidewalks on 118th. In retrospect maybe we should have taken photos of the parks, too – they both had playgrounds full of families, nice green spaces, and at one of them there was a fenced space with a community garden and dogs playing off-leash. So cool. … and their display case didn’t disappoint. They had a steady stream of clients coming in to pick up orders. The Portuguese custard tarts? So. so. good. They also have half the shop devoted to hard-to-find groceries and spices. I wonder if the traffic on 118th is always this busy, or if it gets busier during big events like Capital Ex at Northlands? Ethiopian food! So tasty, and extremely filling. The injera (flatbread) that you eat with tastes a bit like sourdough. Nom! Yeah, the Ledge grounds. After all, it was hot and sunny. How could we resist the chance to go wading? But first we went into the rose garden for a group photo (which will be in Coreen’s post) and admired a bumblebee who was playing in the blossoms. 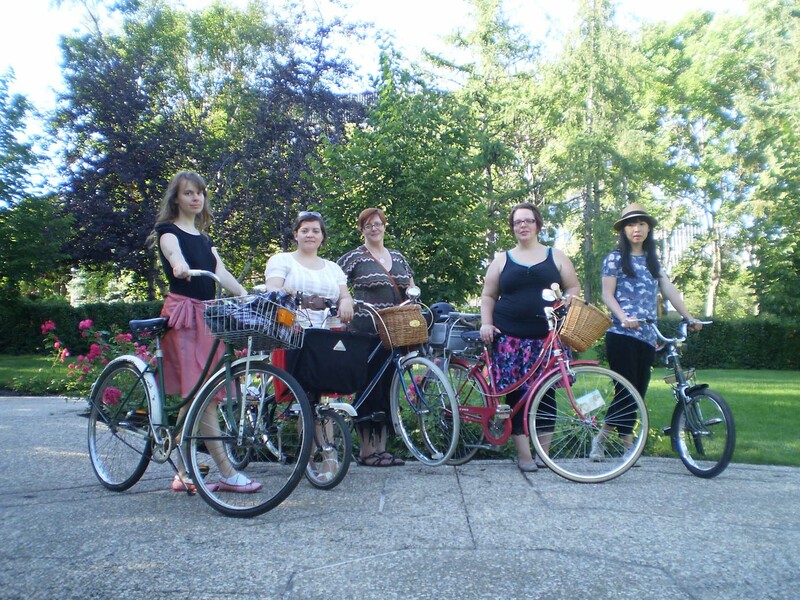 There are more photos from the rose garden in Coreen’s ride report! I love this photo of Coreen. She sewed her floaty wrap skirt herself. So refreshing, and such a great way to finish the ride! Afterward we headed our separate ways, with most of us heading over the High Level Bridge to Bicycle Bottleneck. Thanks to everyone who came out! Those of you who missed it – we’ll see you August 28th! 27 July Update: I’ve been reflecting on the changes on Alberta Avenue. It’s definitely way less scary to spend a sunny afternoon there than it was in 1994 when I first visited, on a mission with my roommate to find stuff for our student apartment at the world’s sketchiest used furniture shops. I remember lots of boarded-up storefronts and pawn shops then, and not a lot of pedestrian traffic. Now we’re seeing families in playgrounds, lots of restaurants, lots of people out walking. There’s a farmer’s market, gallery space, and a number of festivals held on Alberta Avenue now. I expect, now that the infrastructure upgrades are complete, in the next couple of years we’ll see it become an incubator of cool local retail and arts space, in the same way that 124th Street and Whyte Ave have been in the past. I also commented above that the working-class neighborhoods we rode through were divided until fairly recently from downtown by railyards; Marilyn notes in her blog post that the arena project proposed for the redevelopment of that land could make that division permanent. Go read! PS: This post is part of our series for the LGRAB 2011 Summer Games! It could qualify in several categories – this was a new part of town and took in new-to-us bike paths – but we’ll just call it a group ride. Let the games begin! Reminder: Sunday July 24th will be the next Edmonton Critical Lass ride! So you can check out A Taste of Edmonton before the ride, if you like, we’ll meet at 1:30pm in front of the Winspear Centre and depart at 2pm. We’ll ride via 95th Street (and Chinatown and Little Italy) to Alberta Avenue, so we can see for ourselves its’ revitalization from a neighborhood that a decade ago was best known for pawn shops and drug-related crime problems, now that the infrastructure changes from the Streetscape Improvements program and storefront facade renovations are mostly completed. We’ll likely make stops at The Carrot, Bedouin Beats, and Handy Bakery, and have our supper at Habesha (Ethiopian, and we hear they’re vegetarian and vegan friendly!). Originally, our plan was to ride all the way to Northlands, grab a group photo with Gretsky, then take our bikes on the LRT – but since Capital Ex is on, we expect Coliseum Station to be a bit too crowded for bikes. So, now we think we’ll loop back to downtown before going our separate ways. Any feedback on the route, ladies? We’ll be starting about where the blue oval marked 3 is (that’s the AGA), taking the on-road bike path on 102 Ave (that’s Harbin Road, just north of Canada Place, which stands where the original Chinatown was established 100 years ago) through Chinatown South to Jasper Ave, and take that along the upper edge of Dawson Park (it’s not clear whether we can actually enter the park from the top – if we can we can stop and take photos here) to where it turns north and becomes 82nd Street. Where 82nd crosses the LRT tracks at 113th Ave, we can get on the MUP (red) then take the on-street path (green) north on 81st Street (past another wee park) to 118th Ave. This brings us out close enough to Northlands to hear the ruckus and smell the mini-donuts from Capital Ex, close to the eastern end of the section of Alberta Ave that’s had infrastructure upgrades. Then we’ll ride west on 118th, check out some places, and stop for supper. Afterward we’ll take 96th Street south and pick up the on-street path (green) that skirts north of downtown to head to 109th Street, then south via the MUP (red) and across the High Level Bridge to Bicycle Bottleneck. When they reopen for the day I’ll call Habesha and ask them about the timing – whether they want a group to show up for the 4pm coffee ritual, or want us to make reservations for later, will determine whether we move our start time a bit later. Our reservation is for 4pm at Habesha. Sound OK? Our fifth Critical Lass ride was the first on an evening that was threatening rain, after a few solid days of unusually wet and miserable weather, so our group was small but mighty. We met at the Bicycle Bottleneck, and lingered there chatting for awhile while some of us finished our chai, lattes, and poutine. Spoke cards installed and ready to roll! Talking about the spoke cards Deb made. (No matter how carefully you trim and lay them out, they shift in the laminator – argh! We’re so happy that Selene was able to join us during her brief visit! Lots of stylish raincoats and cardigans. Plastic capes in case of a downpour stashed in baskets and messenger-style bags. Selene’s sweet Raleigh mixte – swoooon. Monie’s Apollo with awesome cork-looking grips! … and it has intact Fred Deeley Cycles decals. Can you believe that Marilyn’s fab shoes are second-hand? and headed south on the multi-user path beside the LRT on 114th Street. after picking up Miss Sarah en route. The official bike path takes a detour into Lendrum that’s a bit difficult to follow. Where the bike path rejoined our route, we were split between street and path for the first block. so we ended up single file on the sidewalk for a few blocks until we could cross at 40th Avenue. By this time the sky was clearing and trench coats were feeling rather warm. It’s so hard to get an unposed photo of Miss Sarah without her camera in front of her face. large lots, mature trees, lots of bungalows and split-levels. Traffic was light on 40th Avenue and 106th Street so we felt really comfortable taking the lane. Monie does mock outrage pretty well, no? This sign was next to the bike racks we used at Whitemud Crossing. Our destination. So good we forgot to take photos of the delicious food. and could indulge in serious girl talk. Heading north on 106th Street before we all headed our separate ways. Isn’t Geneva’s belt-bag the coolest dumpster dive find ever? After parting ways to our various end points (some took to LRT for speedy home time, others returned to the Bottleneck), myself and Deb rode over to the multi-use path beside 91 street and down to my place in Mill Woods. Google maps says we did just under 20km total that evening. It felt great! Deb with her ’72 Phillips, just before we swapped bikes on the way back to Mill Woods. Luckily, it never did rain – not even a drop! Thanks to everyone who came out for a delightful evening. Your camaraderie would have made it fun even if the heavens had opened! Update: Coreen’s ride report is up! Route: this time we’ll meander through the neighborhoods around the University of Alberta, south on the multi-user path along the LRT line, and east on 40th Avenue to the Whitemud Crossing area (which will soon be easily reachable via the soon-to-be-installed 106th Street sharrows). Yokozuna Japanese Restaurant and Thai Valley Grill are among our choices for food afterward. Update: yes, we know showers are currently in the forecast. We’ll ride rain or shine. since our lovely friend Eri is too busy to make pins.